The CB55+ Hot Shots group meets Monday from 10:00 – 11:30 am. in the basement of the Cordova Bay Community Centre located at 941 Sutcliffe Road (coffee at the Centre after). 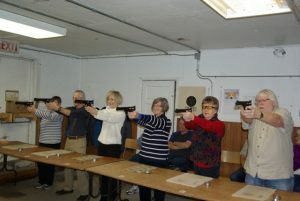 If you would like to try target shooting with air powered competition target pistols in a safe environment, please sign up at the CB55+ office. The cost is $15.00 sign-up fee and an additional $3.00/session attended. The next session is January 7th to March 18th, 2019. Please contact the office or Lorne Brack (lorne.brack@icloud.com, 250-479-8689) with any inquiries.